(PRLeap.com) January 21, 2016 - The way in which people organize special events or a simple hang out with friends is about to change with the release of the new organizer app; Are You In. 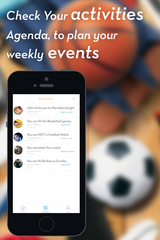 This organized and simple to use app enables users to create an event with specific details, invite a certain number of guests, and get quick feedback from their guests in a simple and easy way. The release of this app will allow for users to better manage their plans in a much easier and hassle free way. Some of the highlights of Are You In include: choosing or creating one’s own template to share the event and setting a maximum capacity of people that can be invited to avoid too much commotion or overload of people. These features are what give this app the personalized yet organized design. What makes Are You In stand out from the crowd is the design of guests selecting a yes or no button for quick and easy responses. One of the app’s biggest features is the ability for users to sync his or hers personal calendar with the apps’ calendar. As for the future of the app, the team promises it piece by piece, until users succeed to organize, vote, and decide and entire event together with their fiends. Are You In has opened the door in planning and organizing events on a large scale. A spokesperson for the company has stated, "We promise you a fun journey together" and this is exactly what the creators and developers of this company are accomplishing. Are You In is now available for free in both the App Store and Google Play. More information on this innovative app can be found on their website at www.areyouinapp.co or on the company’s Facebook and Twitter page. Are You In was an idea created and developed by Co-Founders, Tal Holander and the brothers, Itay & Gil Niftily, who already succeeded with their last app - "Me App". Holander alongside his teammates, based out of Israel, have developed a successful app to better the time and efficiency of users in planning events with friends and families.